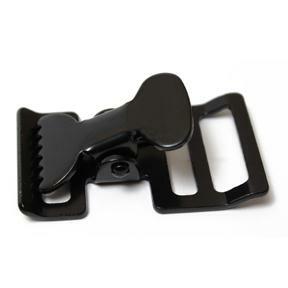 1" Spring Webbing Buckle - Powder Coated Black Steel are also known as Footman Buckles and are very simple to use. One end of the webbing is sewn and affixed to buckle, the other end is fed through the spring loaded alligator teeth of the buckle and pulled taunt. 1" webbing slides easily through the opening on this Spring Buckle.